Once Pres. Obama ventured down to Cuba, you knew the forces of capitalism would soon follow. 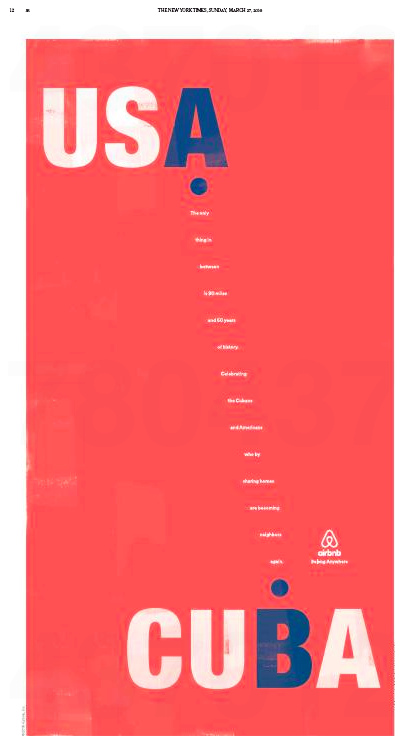 One of the early corporate Cubano$: Airbnb, which ran the full-page ad in yesterday’s New York Times. The only thing in between is 90 miles and 50 years of history. Celebrating the Cubans and Americans who by sharing homes are becoming neighbors again. And who by sharing homes are becoming cash cows. This entry was posted in Uncategorized and tagged Airbnb, Cuba, Cuba libre, Cubano$, New York Times, Pres. Obama. Bookmark the permalink.